Here’s Butch Hobson, who is really mad. 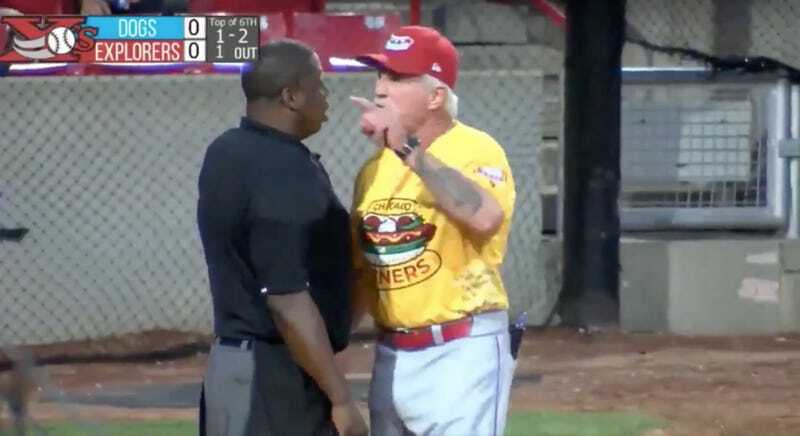 The Chicago Dogs skipper, who used to manage the Red Sox, was so pissed off that an umpire apparently called a strike on a check swing that he grabbed himself a bat and demonstrated how the at-bat would have gone for his player had the third strike not been called. It seems that the umpire robbed everyone of a home run. Too bad! At least Hobson made sure everyone got their money’s worth. Between this and Brennan Metzger’s trashcan freakout, the American Association of Independent Professional Baseball is quickly becoming the go-to destination for premium meltdowns.